Like much else in American life, the cowboy and his language, tools, techniques, and the cattle he herded are amalgams of imported influences. In this case, Spaniards laid a foundation that environmental, indigenous, and later British influences would mold into the American cowboy. Spanish influences in Texas arrived with the soldiers, missionaries, vaqueros, and settlers who fanned out across the vast frontier, beginning in the late 17th century. The Spanish nobility had originally barred nonwhites from riding horses, thereby reserving the equestrian life for the upper class. It was too dangerous and democratic to let nonwhites rise up from the ground to mount a horse. The growing demands for ranch workers, however, coupled with the Spanish elite's aversion to manual labor, opened riding to Indians, blacks, and mestizos. Franciscan missionaries brought their mission system, which included livestock raising, into many areas of Texas from 1682 to 1793, establishing some 26 locations in all. Indian depredations doomed some efforts, but after about 1750, Franciscan missions as well as private ranchers became the principal stock raisers in Texas. Franciscan activities centered at missions in the San Antonio River valley from San Antonio de Béxar to La Bahía (Goliad), where missionaries trained Indian neophytes to ride horses and handle cattle. In early spring 1721, the Marqués de San Miguel de Aguayo recruited 500 men for an "entrada" or colonization effort in East Texas. He set out with 2,800 horses, 4,800 cattle, and 6,400 sheep and goats. 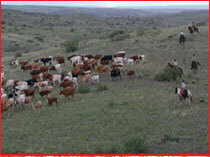 Significant Spanish ranching and thus vaquero life in Texas accelerated because of his efforts. Later colonizers, such as José de Escandón, brought more livestock to Texas beginning in the late 1740s. Thus Mexican vaqueros, both mestizos and acculturated Indians, worked cattle in Texas long before the arrival of Anglo-Saxon immigrants from the United States. On the vast open ranges of west Texas or in the brush country of south Texas, vaqueros developed special techniques and equipment to handle unruly Longhorn cattle. Early Anglos, with no such open-range experience, adopted these practices. South Texas cowboy Frank Graham described the vaquero as a "master teacher. He was here before Anglos came, and he gave his terminology to us." The vaquero showed Anglos "how to work cattle in this wild, open country. And the vaquero knew the brush; the English did not. 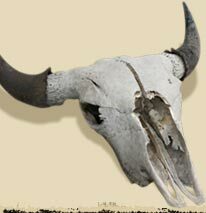 "1 Armando C. Alonzo provides an excellent case study of early "ranchero" life in south Texas in his book TEJANO LEGACY.